After making two feature films that combined live action with animation (Song of the South and So Dear to My Heart), Walt Disney had his sights set on making a third film in a similar manner. So in 1948, Walt Disney and a team of artists went to Ireland for inspiration. While there, Walt publicly announced that he was making a film called "The Little People" based on two books by Herminie Kavanagh about a man named Darby O'Gill and the stories he told about Leprechauns. However, the idea was soon shelved when Walt got too busy with the revived feature animation department and the planning of his groundbreaking theme park, Disneyland. Ten years later the film was put back in production, this time as an all live action feature. 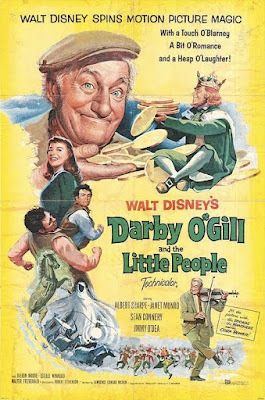 The title was changed to Darby O'Gill and the Little People and a new script was written by Lawrence Watkin, who wrote several earlier Disney films including Treasure Island, The Story of Robin Hood, and The Light in the Forest. Robert Stevenson was assigned to direct after directing Old Yeller and Johnny Tremain. He is most famous for directing Mary Poppins. Walt cast Albert Sharpe as Darby O'Gill after seeing him in a play. Newcomer Sean Connery was cast as well and it was this film that brought him to the attention of Albert Broccoli who cast him as James Bond. Jimmy O'Dea was cast as the king of the leprechauns, but received no screen credit because Walt wanted audiences to think that the leprechauns were real. In fact, the film even begins with a thank you note to the leprechauns from Walt. Darby O'Gill is the caretaker of a wealthy estate where he lives with his daughter, Kate. However, his boss forces him to retire due to his age and the fact that he spends most of his time at the pub telling stories about his failed attempts to catch the king of the leprechauns. His boss sends a younger man, Michael, to take his job just as Darby is captured by the leprechauns. He escapes and is able to reverse the situation by capturing King Brian and making him grant three wishes. Darby's first wish is for the King to stay with him for two weeks while he thinks about his other wishes. Darby accidentally wastes his second wish as Katie and Michael begin to like each other, but when she finds out that he is here to take her father's job, she runs off and gets injured. As the banshee and death coach comes for Katie, Darby uses his third wish to ward it off and save her life. However, it turns out that they weren't after Katie at all and actually came for Darby. King Brian rides with Darby to inform him that Katie is alright and he releases Darby from the death coach. The film ends with Katie and Michael together and Darby living with them. Darby O'Gill and the Little People opened on June 26th, 1959. It was critically acclaimed for its great performances, groundbreaking special effects and representation of Irish folk lore. Unfortunately, audiences didn't respond the same way. Despite a full episode of Disneyland devoted solely to promoting the release, it failed to find an audience. It was later re-released in theaters in 1964 and many of the actors voices were dubbed over due to complaints that audiences couldn't understand the dialogue. It didn't find success until it was broadcast on television. Today, Darby O'Gill and the Little People has a moderately large fan base and has become a perennial holiday classic around St. Patrick's Day. The film really deserves more success than it has received. While sometimes slow paced, it has many qualities that make a great film. The special effects look great and most of the techniques created for this film are still in use today. Leonard Maltin considers this to be one of the best Disney films. Hopefully it will continue to gain success as new generations are introduced to this delightfully whimsical film. Walt Disney's Darby O'Gill and the Little People was released on DVD in 2004 and is still in print. The DVD boasts a new restoration, a retrospective interview with Sean Connery, a look at the special effects and the hour long episode of Disneyland that promoted the film to audiences. The DVD presents the film in fullscreen, which it claims is the original aspect ratio. However, there is a discrepancy on that issue. The original projection guides sent to movie theaters during its original release instructed them to crop it in widescreen, which would make fullscreen the incorrect aspect ratio. But when I attended a screening of the film at the D23 Expo, they presented it in fullscreen. At any rate, the fullscreen version feels perfectly framed, leading me to believe that it is indeed the correct aspect ratio. It is also available in a 4-movie collection where it is paired with The Gnome-Mobile, The Happiest Millionaire, and The One and Only Genuine Original Family Band. The film is also available on iTunes where it is presented in fullscreen and in HD.